Hotel Rex San Francisco takes its inspiration from the San Francisco art and literary salons of the 1920s and 30s. This hotel in Union Square San Francisco will take you back in time with custom decor and works of art from local artists. We can host everything from corporate meetings to private parties to literary events. High-speed Internet access is available in all meeting spaces, and we offer complete onsite catering services and audio/visual equipment. Lunch Buffet Selections - Cold Deluxe Assorted Sandwiches • Smoked Pork Loin Torta with Queso Fresco • Grilled Portobello Mushroom with Smoked Mozzarella • Grilled Lemon Chicken with Havarti • Grilled Vegetable Wrap • Club Wrap • Couscous Salad with Assorted Vegetables • House-made Potato Chips • Lemon bars & Chocolate Chip cookies Deli Buffet- $30 per person Lunch Buffet Selections - Hot - 15 person minimum Mediterranean Lunch Buffet - $42.00 per person West Coast Lunch Buffet - $44.00 per person Please review our attachment for complete details. Italian dinner buffet - $48.00 per person • Caprese salad • Antipasto platter • Mixed greens with white beans, cucumber and olives • Homemade three cheese beef lasagna • Chicken picatta with capers and lemon butter • Steamed seasonal vegetables • Creamy polenta • Tiramisu • Freshly brewed coffee, tea and iced tea Californian Dinner buffet - $48.00 per person • Organic greens with balsamic vinaigrette • Potato and artichoke salad • Grilled free range chicken • Baby spinach and mushroom marsala sauce • Poached Pacific salmon with citrus beurre blanc • Rice pilaf • Seasonal vegetable • Crème brulee • Freshly brewed coffee, tea and iced tea Please review our attachment for complete details. Each suite is over 800 square feet, perfect for small corporate conferences, as breakout rooms or as production offices. The Hotel Rex has our unique and distinctive "Salon" which features over 1100 square feet of event/meeting space, with original art work by Bay Area artisans, skylights, state-of-the-art lightning system and custom designed furnishings and décor. 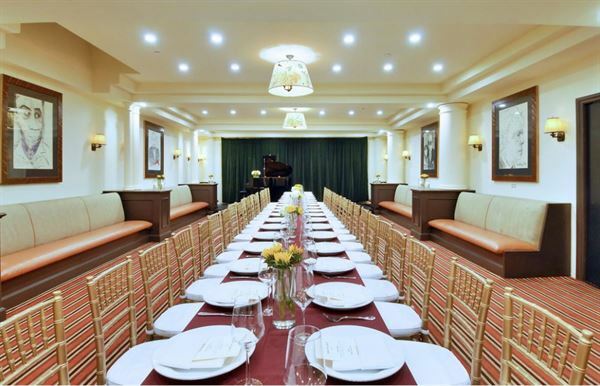 Atmosphere/Decor: Corporate meetings, wedding receptions, rehearsal dinners, showers, brunches, literary events and private parties have all been hosted at the Hotel Rex. Special Features: Hotel Rex San Francisco offers a wide range of complimentary amenities for our guests such as an evening wine hour, business center use, turn down service, and daily newspapers such as the Wall Street Journal and New York Times.